Located on the beautiful Fox River, the Ray Van Den Heuvel Family Campus Center is the place to be at St. Norbert College! We hope you’ll visit us for more than just picking up your mail. The Campus Center’s Entertainment 2 Knight program hosts a variety of entertainment throughout the year. 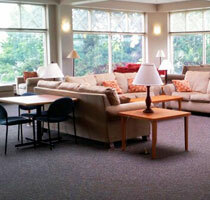 You can attend a wellness class on the second floor, to get or stay healthy. Phil’s, one of the campus’ premiere dining spots, is located in the Campus Center. In addition to serving up some of the best food on campus, Phil’s sells a variety of sundries for when you're in between trips to the store. Grab your books and visit the fireplace lounge on the main level of the Campus Center, or seek out the reflection lounge upstairs for a warm and inviting place to study. Both locations – and Phil's – have WI-FI.